It’s a wild world, digitally speaking, and teenagers — who navigate much of their emotional lives in the digital sphere — are often out there alone. The nature of the medium, combined with the nature of adolescence, leads to private exploration and intense interactions with peers. Developmental psychologists Robert Selman and Emily Weinstein —respectively, a professor and an advanced doctoral student at the Harvard Graduate School of Education — have embarked on a project to learn more about what teens are encountering online, how they cope with it, and how their digital interactions color their close offline relationships. What they’re finding is that teens are experiencing a range of difficult situations and pressures, and that they’re unlikely to go to adults for help unless those situations are overtly hostile. feeling pressure to comply with requests for intimate photos or access to accounts. These six “socio-digital stressors” fall into two distinct categories, the researchers determined. The first three stressors are hostile and mean — classic cyberbullying. The second three arise as young people manage and navigate close relationships in a digital realm. Cyberbullying gets the attention, but that second category of stress can be more nuanced, the researchers found, and less well recognized. And what’s more, kids are less likely to ask for help when dealing with it. This type of stress arises from interactions that aren’t overtly hostile at the start, but that impose an increasing burden and lead to confusion about how to respond: a controlling friend who texts all the time, another friend who spies on your photos or breaks into your inbox, a romantic partner who pressures you to send inappropriate selfies or give him access to your digital accounts. The most common recommendation that teens gave for the hostility-oriented situations — the cyberbullying — is to get help. But for issues related to that second category of stress —arising from close relationships — teens’ most common recommendation to their peers is to cut ties. Ignore the situation was the most common overall piece of advice, in all contexts. Some of these reactions align with what we know about how adolescents seek out help in the real world, as the paper documents. Teens have a strong preference to seek help from informal sources and peers, rather than from health professionals and educational workers, particularly when the issue is interpersonal or emotional. They are more likely to seek help from adults when the issue is perceived to be one of personal security and safety. In the current study, “it was interesting to us to find that the recommendations to get help tended to advocate help from adults, and particularly from those in positions of authority,” says Weinstein. To the researchers, this seemed like an indication that adolescents perceive hostility-oriented digital issues as a big deal and as genuinely threatening. On the other hand, adolescents rarely recommended getting help for the kinds of digital issues that arise as they manage the challenges of their close relationships. Learning to navigate these digital exchanges with friends and partners is important, Weinstein says — and it’s something most adults would probably want to help teens manage. “The onus is on us to communicate our openness to and interest in helping youth process and navigate these situations,” Weinstein says. That’s especially true when peer advice is unreliable. “Cutting ties” — the most common peer recommendation for managing the second type of stress — is well intentioned, but it may not be too useful. “The very nature of Type 2 stressors is that youth often want to preserve and even enhance the relationship,” Weinstein says. In a similar vein, “telling someone to try to ignore the situation” — the most common teen advice — “is a recommendation that may initially seem helpful, but is often quite difficult in practice,” says Selman, who is also a professor of psychiatry at Harvard Medical School. The bottom line is that “cyberbullying is just one slice of the digital experience that adolescents grapple with,” says Weinstein. “So the question becomes: how can we support them in managing every type of digital stress? Offer an empathetic ear, and try not to be dismissive. Convey interest in understanding the breadth of socio-digital challenges teens experience, and in being a partner as they navigate these challenges (hostile and otherwise). 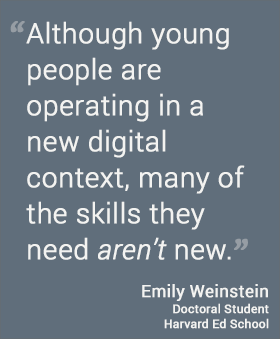 Realize that although young people are operating in a new digital context, many of the skills they need aren’t new. Learning how to align their behavior with their values, identifying their individual needs, and developing the confidence to communicate effectively with others — these are the evergreen challenges of adolescence. Note: In this work, Weinstein and Selman collaborated with Sara Thomas, Jung-Eun Kim, Allison White, and Karthik Dinakar. Thomas, Kim, and White are all former master’s students at HGSE who are now doctoral students — at Northwestern, Columbia, and Boston College, respectively. Dinakar is a doctoral student at the MIT Media Lab.